The Ripley Elite Darts Singles League have staged for the very first time their FA of Darts Singles Knockout which proved to be very success with 57 of the area’s finest darts players assembling in the newly refurbished Somercotes Snooker Club, 69 Leabrooks Road, Somercotes, Derbyshire, DE55 4HB to do battle for the honour of being the very first winner of the competition. The format was the best of eleven legs with a re-draw after every round and despite the extended games the organisation and efforts of organisers Nick Kirk and Daz Brown ensured the highly competitive tournament was wrapped up in just under six hours. Matlock man and current Derbyshire county men’s team captain Lee Stanley prevailed beating some top quality players en-route to the final. In the last four games Stanley beat Paul Baker 6-3 while from the other side of the draw REDSL chairman Daz Brown took Pete Burgoyne to a deciding leg before bowing out. Lee Stanley kept his superb form going throughout the final and eventually ran out the 6-4 champion to clinch the top prize of £400 with Burgoyne collecting £200 as runner up. Losing semi-finalists Daz Brown and Paul Baker each received £100 and there was £25 for players going out in the quarter finals Aaron Bennett, Nigel Daniels, Jack Kerr and James Parkin. The free to enter first round losers competition was won by Keith Lodge who beat Sean Lambert 3-1 in a great final to pick up the first prize of £50 with Lambert collecting £25. There was £10 for each of the losing semi-finalists Sam Revill and Dale Robinson. Full Results:Last 64:- Nick Morton 6 Ben Lawrence 2, Ian Allcock 6 Neil Beresford 3, Tony Jacklin had a walkover, Jack Kerr 6 Dale Robinson 5, Wayne Howe had a walkover, Dave Allcock 6 Kev Rimmington 1, Steve Arkwright had a walkover, Pete Burgoyne 6 Lee Arkwright 1, James Parkin 6 Mick Chapman 2, Steve Soar 6 Colin Rich 1, Paul Holman 6 Luke Pilgrim 5, Lee Stanley 6 Phil Drinkall 1, Aaron Bennett had a walkover, Scott Parkin had a walkover, Daz Breedon 6 Shane Robinson 0, Charlie Marshall 6 Sean Lambert 2, Nigel Daniels had a walkover, James Thompson 6 Jim Beardmore 1, Stuart Barrowcliffe 6 Sam Revill 3, Jordan Beresford 6 Damian Donoghue 3, Connor Hodgkinson 6 Curtis Thorpe 2, Paul Baker 6 Gaz Jowett 0, Wes Smith 6 Danny Cooke 0, Dean Allsopp had a walkover, Ash Spencer 6 Trev Tye 1, Paul Coward 6 Stuart Biggs 2, Ash Wood 6 Dan Ford 5, Daz Sinfield 6 James Hewitt 2, Aden Kirk 6 Ty Ward 1, Nicky Bell 6 Keith Lodge 5, Daz Brown 6 Daz Webster 5, Dave Fritchley 6 Michelle Adkin 0, Last 32:- Steve Soar 6 Aden Kirk 4, Daz Brown 6 Steve Arkwright 1, Paul Baker 6 Dean Allsopp 3, Jack Kerr 6 Nick Morton 4, Aaron Bennett 6 Paul Holman 2, Ash Wood 6 Ash Spencer 3, Ian Allcock 6 Jordan Beresford 3, Lee Stanley 6 Connor Hodgkinson 3, Dave Allcock 6 Wayne Howe 1, Daz Sinfield 6 Daz Breedon 5, Nicky Bell 6 Charlie Marshall 5, James Parkin 6 Wes Smith 3, Tony Jacklin 6 Paul Coward 5, James Thompson 6 Stuart Barrowcliffe 5, Pete Burgoyne 6 Scott Parkin 2, Nigel Daniels 6 Dave Fritchley 3, Last 16:- Nigel Daniels 6 Steve Soar 4, Paul Baker 6 James Thompson 5, Lee Stanley 6 Nicky Bell 2, James Parkin 6 Ash Wood 3, Pete Burgoyne 6 Daz Sinfield 2, Aaron Bennett 6 Tony Jacklin 4, Jack Kerr 6 Dave Allcock 3, Daz Brown 6 Ian Allcock 1, Quarter Finals:- Daz Brown 6 Aaron Bennett 1, Pete Burgoyne 6 Nigel Daniels 3, Lee Stanley 6 Jack Kerr 5, Paul Baker 6 James Parkin 3, Semi-Finals:- Pete Burgoyne 6 Daz Brown 5, Lee Stanley 6 Paul Baker 3, Final:- Lee Stanley 6 Pete Burgoyne 4, First Round Losers Competition:Semi-Finals:- Keith Lodge 2 Sam Revill 0, Sean Lambert 2 Dale Robinson 2. The final week’s fixtures in the Shirley and District Monday Night League produced no surprise results and no changes to the final league table. Champions The Highwood ended their campaign with a convincing 8-1 win over Sharmans Cross giving them a total point’s for the season of 52 six more than runners up Red Lion who were 6-3 winners at Saracens Jesters. The Wharf took third place with the same 56 points as Red Lion but with a lesser average after they completed their programme with a 7-2 win away to Legion Royals. Shirley Spartac won the wooden spoon finishing at the foot of the table as they rounded off the season with a 9-0 defeat by Legion Flights, next to bottom Saracens Jesters had the same 8 points as Spartac but had a far superior average.. Most 180’s for the season went to Andy Foulkes who hit a fantastic 15, the highest finish of 160 was achieved by both Dave Hesketh and Terry Constable. The South Birmingham League staged their singles knockout which attracted an encouraging 49 entries and claiming the title with a final 2-0 result over Charlie Kingdon was Luis Barberan. In the last four games both Barberan and Kingdon won 2-0 against respective opponents Dan Stone and Wayne Cooper. Dave Kingdon (Vice Chairman) Luis Barberan (Winner) and Sue Kingdon (Organiser). Dave Kingdon (Vice Chairman) Charlie Kingdon (Runner up) and Sue Kingdon (Organiser). 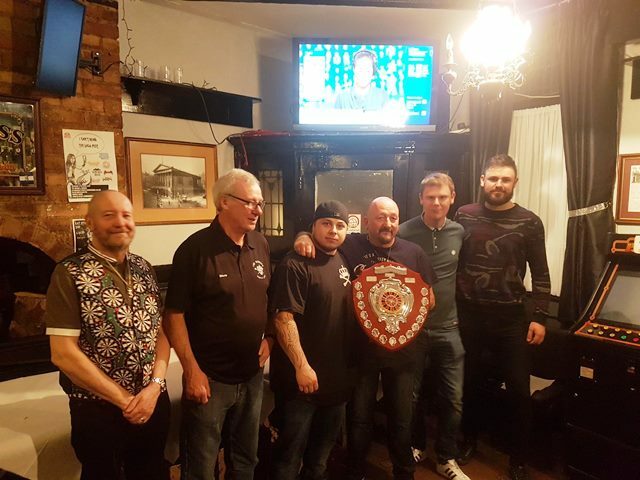 The Camp Hill League held their presentation night at the Wagon and Horses, Adderley Street which saw the hosts Ashley Pearson received a trophy for winning the Consolation Singles Knockout. Best game of the season was a perfect six darts leg recorded by Dan Lee (White Swan Nomads) who also had a maximum break of 170 plus a few 180’s during the course of the season. The John Young Plate Knockout title went to Martin Cooper (E.B.A.H.A.) who with a 2-0 result beat Steve McCarthy from Sheldon Marlborough Flights. Cooper won 2-0 against J.Fisher (Emerald Club) in the last four and McCarthy beat G.Daly (Wagon and Horse) 2-1.